No one can resist such a cute and simple Easter egg! It's the perfect decoration for your daycare while children prepare for the great Easter egg hunt! 1. Gather your material. You will need a large piece of brown cardboard, pastel-coloured Fun Foam circles (or circles cut out of construction paper), scissors, a pencil, white glue, and chocolate sprinkles (used to decorate cakes). 2. 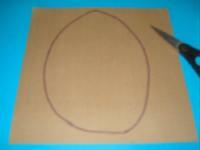 Draw an egg shape on the brown cardboard and cut it out. 3. 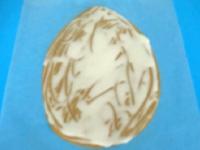 Apply white glue to the entire surface of the cardboard egg. 4. 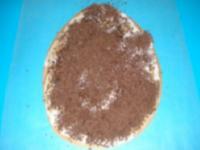 Sprinkle a thick layer of chocolate sprinkles on the egg. 5. 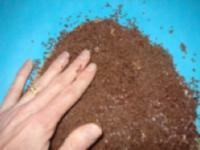 Press the chocolate sprinkles in the glue (what a fun texture for little ones!). Let dry. Gently shake the egg over a garbage can to discard any loose sprinkles and avoid unnecessary cleaning. 6. 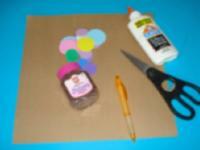 Glue the pastel-coloured circles on the egg to decorate it. Compare the egg's oval shape to the foam circles' round shape with your group. 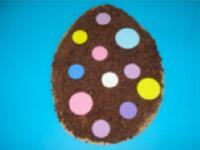 If you wish, you may ask children to decorate their egg with a specific number of circles.